Tickets are currently unavailable for this event - please check back later. Do you want to find out what's holding you back so that you can be the powerful woman you were created to be? If so, the Slay Your Inner Critic workshop is for you. What is an inner critc? We all have an inner critic (or two, or three!) that keeps us from being our naturally powerful selves. The inner critic sneaks into your thoughts and causes doubt, confusion, hesitation and causes you to question your ability to progress in certain areas of your life, eg, you may be confident when you're with your friends, but find it difficult to speak up in meetings at work, deliver presentations,or ask for that payrise you KNOW is overdue. Your inner critic is the cause of delayed progress, failed New Years resolutions (how many times have you cried "New Year, new me! "), difficulty in trusting your decisions, a lack of confidence in your professional & personal life and it keeps you feeling stuck. This is, until you learn how to take charge of your inner critic. Any why attend right before Christmas? That's easy! You managing the voice that has held you back is priceless. What do you want in your life? More confidence? To move on from the past? A pay rise? To start your own business? These are all possible when you learn how to take charge of your inner critic. 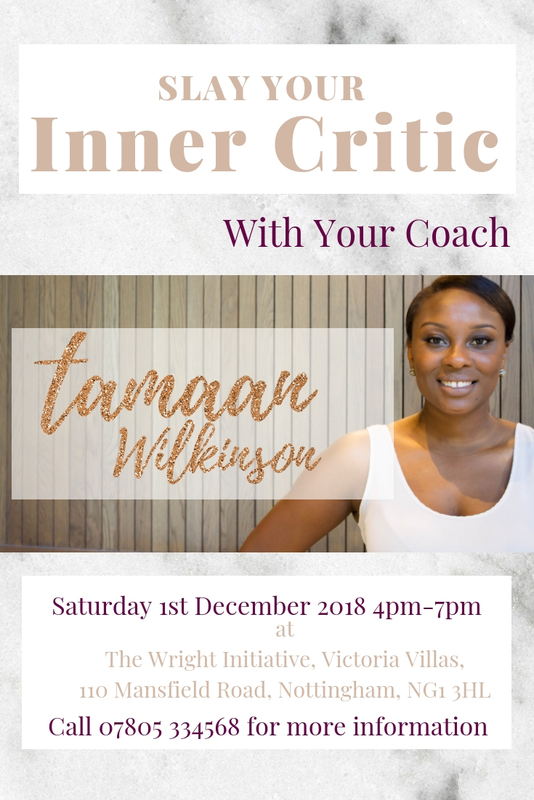 Delivered by CTI-trained coach, Tamaan Wilkinson, Slay Your Inner Critic is the first in a series of workshops for women who are ready to take bold action. Come ready to meet other like-minded women over a glass of prosecco (non-alcoholic drinks are also available) & leave fully empowered to slay your inner critic, ready for 2019.